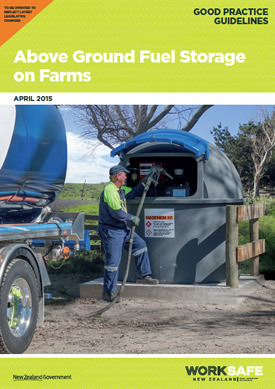 Diesel storage compliance guide for farms, truck stops, construction sites, forestry, mining, industrial sites and rural areas in NZ. Check out this free compliance guide covering site location, site preparation and tank protection and keep your workplace site safe for yourself and staff. Do you need third party or regulatory approval? Sebco Diesel Stations are approved for use by an EPA approved Code of Practice. This code is registered as HSNOCOP 11.2 – Design and Construction of Above Ground Rotationally Moulded Tanks for Automotive Diesel Fuel. Please check with your own district or regional council for any other regulations that may apply to your own situation. Where can Sebco Diesel Stations be located? At an Isolated Logistic Facility, Truck Stop, Construction Site, Forestry Site, Mining Area, Rural Locality, Industrial Locality and Airfield or at isolated places. 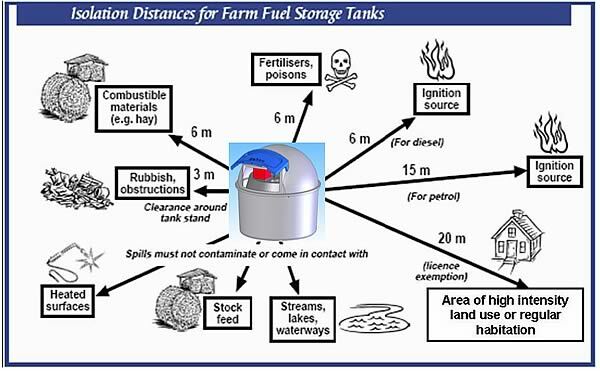 On sites in rural areas and which are used for farming operations i.e. for the production of primary products (agricultural, pastoral, horticultural, forestry etc). Isolated Logistic Facilities, Truck Stops, Construction Sites, Forestry Sites, Mining Areas, Rural Localities, Industrial Localities and Airfields must be separated from an area of high intensity land use by not less than a distance of 45 metres. 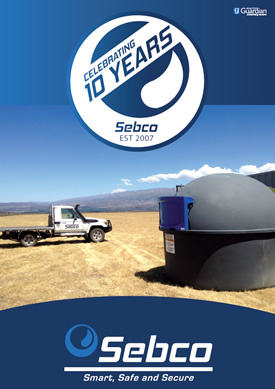 Sebco Diesel Stations must be separated from a boundary by 20 metres unless they are located at an isolated place in which case the separation may be reduced to 6 metres. 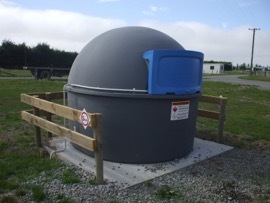 Sebco Diesel Stations must be separated from an area of low intensity land use by not less than a distance of 6 metres. 6 metres from combustible materials, fertilizers, poisons and ignition sources. Sebco Diesel Stations located at the above sites must be protected by the installation of protective facilities (such as a barrier).In circumstances whereby vehicular impact is considered possible, the minimum standard is to withstand a single impact of 2500 kg force applied at 5 m/s or equivalent impact energy. The impact is to be applied across a width of 1m at a height of 0.5 m centered above grade level. The impact is to be prevented from reaching the plan area of the Sebco Diesel Station. Where bollards are used to provide impact protection, these are to be installed with centrelines no greater than 0.5 m apart. 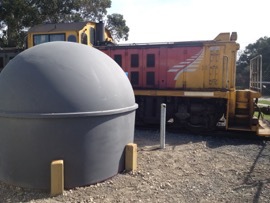 At a location where heavy transport vehicles are present, the impact protection must extend to sufficient height and be installed at a sufficient distance from the Sebco Diesel Station to prevent the vehicle from impacting the stationary tank. An intervening wall is constructed of durable materials (e.g. brick or similar) with a minimum fire resisting rating of 120/120/120 and in conformance with the minimum dimensions given in the table below. Sebco Diesel Stations must be located no closer than 0.5 m to the intervening wall. Separation distance S: the distance between the intervening wall and the area of high intensity land use or boundary. Wing wall length x: the length of the wall beyond the outer dimension of the tank. Parapet height h: the height of the wall above the height of the tank. Return walls: Walls no closer than 0.5 m to the sides of the tank and extending from the intervening wall to the front of the tank. Roof: a roof no closer than 0.75 m from the top of the tank and extending from the intervening wall to the front of the tank. Sebco Diesel Stations must be separated from an area of high intensity land use by not less than a distance of 20 metres. 6 metres from a boundary. (iv) Does not include a small office constructed of non-combustible materials associated with a hazardous substance location that is used by persons authorised to be at the location by the person in charge of that location. Area of Regular Habitation as defined includes any dwelling, hospital, school, airport, commercial premises, office, or other area where people regularly congregate. (d) 900 people on a public right of way. Means a logistic facility (including transport yard, port and railway facility) truck stop, construction site, forestry site and mining area that is located in a rural area or industrial locality or an airfield. An industrial locality is a locality designated for industrial or trade purposes, or a locality used for the storage, transfer, treatment, or disposal of waste materials or for other waste-management purposes, or used for composting organic materials. An airfield is a defined area of land or water intended or designed to be used, whether wholly or partly, for the landing, departure, movement, or servicing of aircraft but excludes that part of the area that is within 100 metres of an Area of High Intensity Land Use. means a place that is typically (but not exclusively) an Isolated Logistic Facility, Truck Stop, Construction Site, Forestry Site, Mining Area, Rural Locality, Industrial Locality and Airfield and which abuts an area of low intensity land use, except that the traffic route which abuts the place may be high density. means a locality which is a country locality or a non-urban locality, which may be designated for the production of primary products (agricultural, pastoral, horticultural, forestry etc), as a reserve, or such similar activities. All tanks containing hazardous substances must have seismic restraining. 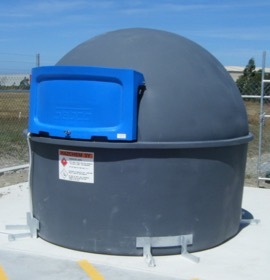 Sebco Diesel Stations have a wind and seismic restraint design certified by registered engineers. Fuel Storage Systems Ltd can supply this restraint system at extra cost, or users of the Sebco products can have the restraints manufactured according to the drawings in the Installation Manual. Feel free to contact us via email if you need a copy of these design drawings.